Pond Pumps - Submersible, Water Gardens, Waterfall, Small & Large The best prices on pumps for fish ponds, koi ponds, water gardens and waterfalls. Includes energy efficient, powerful, and long-life pumps for all applications. 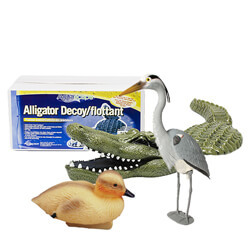 Deter unwanted birds and other predators with the Gardeneer Floating Alligator Decoy. This realistic hand-painted head can float freely or can be positioned atop stone coping. Relocate often for additional effectiveness.